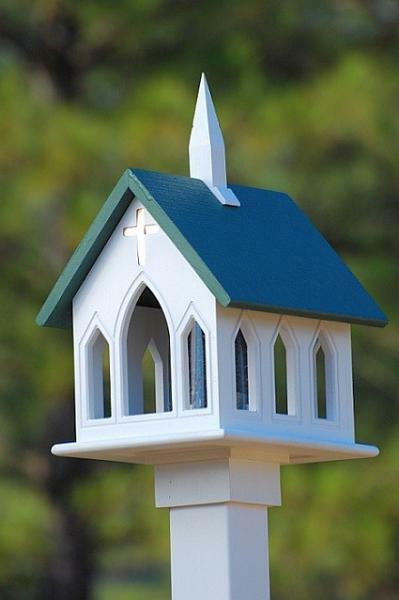 The whole congregation will sing the praises of this beautiful country church bird feeder! Roof colors: Green (shown above), Black, Blue (choose roof color at checkout). Complete with vinyl sleeve-fits on a 4 x 4 post. NOTE:Post NOT included but the sleeve to mount the 4X4 post IS included. The sleeve is 4 inch sleeve that mounts on a 4 X 4 post. Post can be purchased locally at most home improvement stores. OPTIONAL Vinyl square 4X4X72 vinyl post cover available upon request for $60.00. FREE SHIPPING!